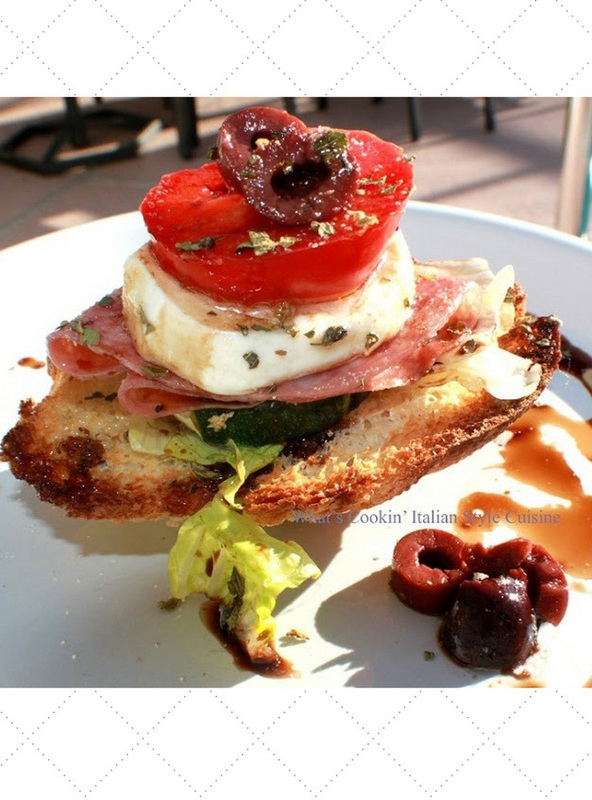 Bruschetta Antipasto Appetizer is anything you add to Italian bread is a banquet for me. 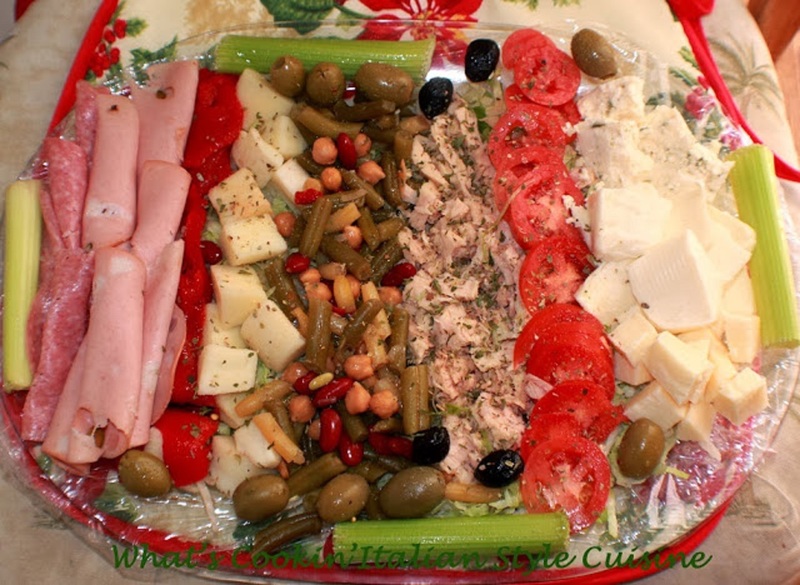 Here is another appetizer I serve to guests instead of making a huge salad this antipasto appetizer. These always are a huge hit! Of course you can add your favorites toppings to any toasted piece garlic bread but this is super tasty! All I can say is you just can''t eat one. Growing up in an Italian household, mom would make lots of Bruschetta Antipasto Appetizers . There would be platters of genoa salami, mortadella, sopressatta, all kinds of olives, cheeses, hot peppers and of course hard crusty Italian bread. 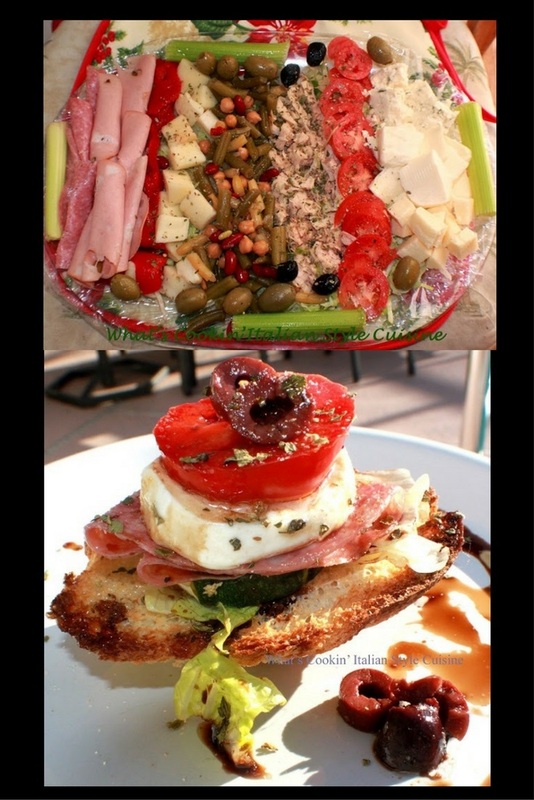 I really love this kind of Bruschetta Antipasto Appetizer, because it's all in one anyway you want to make it. It is dressed with a little of everything on it. 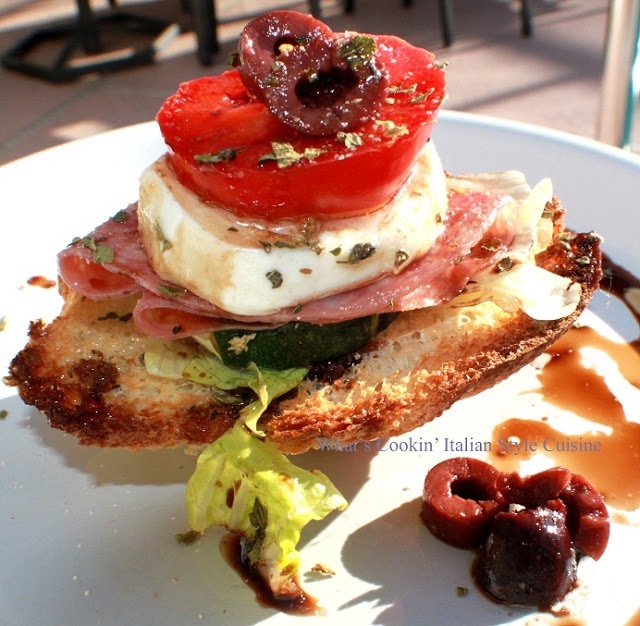 The olive oil drizzled over the antipasto is what enhances the flavors. You can drizzle a good grade of balsamic vinegar on it. That's how I like it. Of course you can add whatever you like to this. Mom loved her dried oregano, fresh basil, fresh parsley chopped garlic all from the garden my dad grew in our yard in Utica, New York. We lived in an all Italian neighborhood. The neighbors shared many of their crops together and all had some kind of garden or fruit trees. It was always a fun time to live in the 1960's. Everyone shared, loved good conversation and shared great food. Now that everyone is gone, I try and recreate those moments in time and of course keep the memory alive in the kitchen. Sunday is always a day of feasting on Italian traditions. This is just one of them I started along the way. I love the ideas on a tray when we have company. That's why I put a little of everything on that tray. They can build their own or I will have them all stacked and ready. Drizzle the olive oil and balsamic vinegar right before serving. These are quite filling with all the meat on them. If you decide you want to try a great bruschetta, I would start here. This is so easy to throw together and you won't have leftovers. It's a great little starter before dinner. Don't forget the Chianti. It's always a nice treat to have that little bit of Italian vino with this appetizer. Dad always kept a bottle on hand. Sunday was always the dad he would have his vino with appetizers. Cut thick slices of bread at least 2 inches thick. Brush with olive oil and add minced garlic. Toast until browned around the edges and crispy on a hot 420 degree oven. Doesn't take long so watch them, about 10 minutes. Layer first with lettuce, zucchini, salami, cheeses, tomato, ending with olives. Drizzle with olive oil, balsamic vinegar, sprinkle with spices of choice you like, salt, pepper. Serve with a garnish of grating cheese. That's quite a creation Claudia - I can taste it from here. That could double up as a sandwich - looks so awesomely overflowing. 3 Yummms up. This looks fantastic. I gotta try this one. From one breadaholic to another, these look amazing. Wish I had one right now. Ha un aspetto meraviglioso!!! Complimenti!!! I left a comment on your awesome bruschetta, don't know if it went through! So many delicious ingredients! Something for everyone! !